Seat belt: these baby swings contain a different number of safety belts. The ones in this review contain either a three-point or five-point harness. This ensures your child is always firm and secured to the swing. The height of the swing: these swings come in varying sizes. Get one like the ones in this list that adapt to your child’s growth. With this style, you can be able to use them for a long time or adjust to fit your own preference. The number of swing speeds: the swing speeds on these rockers vary from different brands. This can be a factor for many parents that want more or fewer customizations on the swing. Some have higher highs or lower lows speeds and depends on how you want it. How mobile are you? If you like to travel with your child, you can get a baby swing that is light in weight and has features that make it easy to move it around. Some of these baby swings are made of a plastic or metal frame. This is a major factor when it comes to the baby swings weight. Features: some swings come with handy features of which we do highlight. Some features can be a bonus for some parents, for example, some of the baby swings can also convert to a cradle for your baby to sleep in. You can have a timer to stop the swing at selected times when you are not around. We highlight some of these in this review. 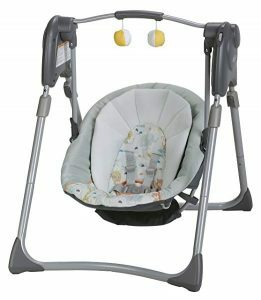 The swing relaxes and comforts your child as you go on with your work. You do not necessarily have to have more people to assist you with the baby. You reduce pressure on yourself both mentally and physically. With all that said, lets now look into the best baby swings in the market. This delightful baby swing from Ingenuity is easy for you to move around with it. This full sized baby swing is made from a compact frame. Your baby will rest easy enjoying automatic swinging motions. The music is of soothing nature sounds and melodies. It has a 5-point harness and Non-slip feet ensure stability and safety for your young one. The ultra-soft seat pad guarantees comfort to the baby. This swing grows with your baby thanks to its weight adapting technology. • This swing from Ingenuity can alternate between the battery and electric power. • The extra head support can be removed when baby outgrows it. 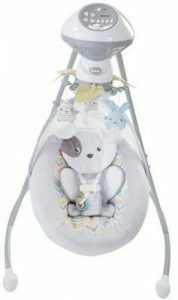 The best thing about this baby swing from Graco is that is can be switched to a sleeper. This can be done easily with one hand on the recline lever. You do not necessarily have to move your child from the swing to the bed as is recommended when they fall asleep. It comes with up to six different swing speeds to suit your baby’s mood. • Features a 2-swing vibration for added motions. • The toy bar contains three little owl dolls to visually stimulate your baby. 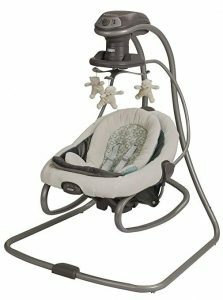 This magnificent baby swing from Graco features height adjustable legs. This lets you switch between a compact and a full-sized swing. Your baby will always be at the perfect height for interaction. This is a perfect device if you like to move around with your baby. This is possible due to the carry handle and can work on batteries. • It can fold easily for you to store and save on space if needs be. • Washing machine and dryer can be used to clean its padded seats. At number 7, we have a well thought out swing to offer the maximum amount of comfort to you and the baby. DreamComfort fabric technology has a breathable fabric design to ensure your baby is cool and rests serenely. 180-degree rotation on the swing ensures you will be able to look at your child from a wide angle as you go on with your business. Its foldable design is lightweight and can be moved from place to place easily. This swing from Ingenuity can be paired with a smartphone to play your preferred music. 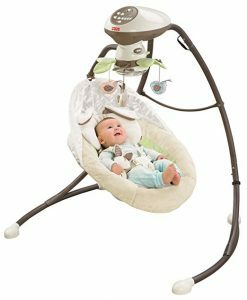 • This baby swing has 6-swing speed and can sway in three different directions. • Wheels on the bottom of the swing make it easy to move it from place to place. This baby swing is made to mimic five rocking moves just like a parent to comfort the baby. Some of the moves are car ride and tree swing. With it, you can choose up to five different speeds. The seat reclines allowing your baby to lie back and relax or sit up and play. This baby swing is a work of art. 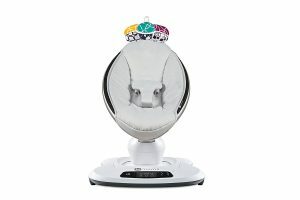 • Features Bluetooth to control the motion, sound, speed, and volume on the baby swing from a compatible smart device. • Includes interactive toy balls to entertain your baby. 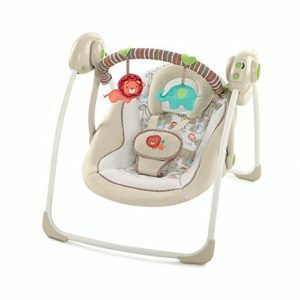 Your child will absolutely love to be in this Fisher-Price baby swing. It comes with two different swing motions of side-to-side and head to toe. The machine washable seat is ultra-plush and comfortable for your kid. You can use it on AC power to save on batteries or batteries when you are not near an outlet to plug in. 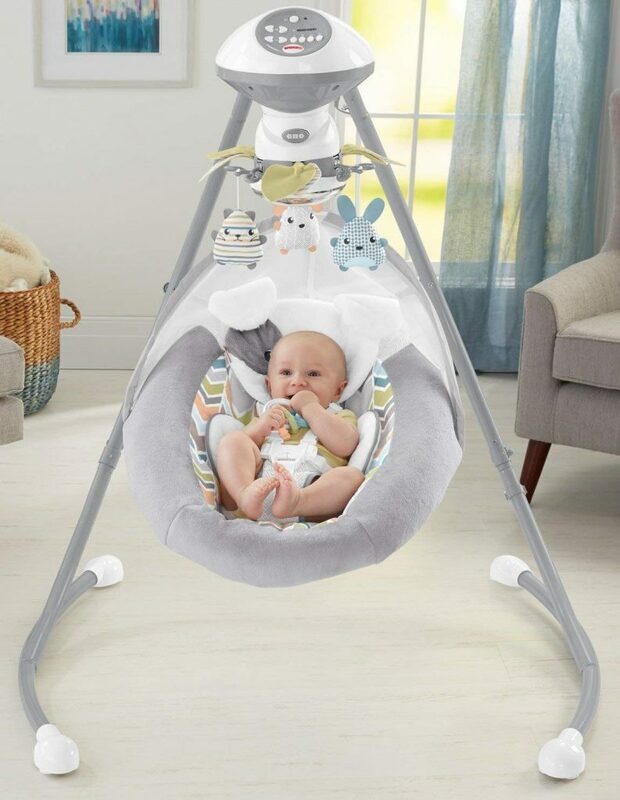 • This baby swing has toys and a mirrored dome for your kid’s delight. 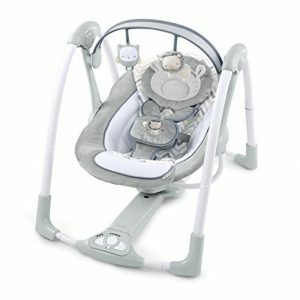 • You can connect your compatible smart device to the baby swing to control the speed, and motion of movements. This is one of the best swings you could get for your baby. It has smooth and gentle jerking motions just like a gliding chair. 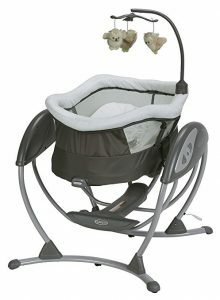 You can store this baby swing easily since it folds up, taking little space. In addition, this design from Graco lets you carry the device around easily. It was designed with 6 gliding speeds and also comes with a timer as well. • The baby swing is available in a standard size. • It has a 5-point harness for stability and safety. This comfort baby swing lets you get on with your work as your baby unwinds. It also keeps your baby safe when you need a second set of hands. Its plush fabrics cradle your baby in a snug embrace. It is difficult to figure out who likes this swing more, the baby or parent. You can take it with you easily since it has a foldable design and weighs only 5.5 Lbs. • With TrueSpeed technology, the swings acceleration adapts to your child’s growth. The speed remains consistent. • No tools are required to assemble this device since everything clicks right in place. Great things come in small packages. 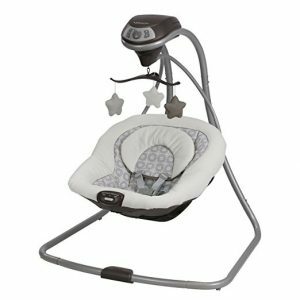 This awesome smart swing by Graco features a ton of features to help you comfort and soothe your baby. It is made of a compact frame design making it easy to keep your baby close to wherever you are. 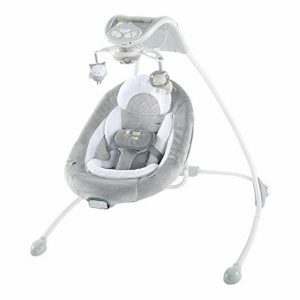 The baby swing features a removable infant head support, to keep baby cozy and comfy. • It has 3 mobile soft toys. • Your child will get the visual stimulation thanks to the toys. Finally, we finish off our review with the Snugabunny from Fisher-Price. This baby swing starts out as an infant seat with entertainment overheads. As your child grows, you can easily remove the toy bar and convert it to a toddler rocker. This is a necessary swing for new parents to give you peace of mind. Even though it takes your baby a little while to get used to the swing, it is totally worth it. • It can swing from side to side or head to toe. • Up to six different swing speeds are available on the swing. When you get your hands on either of these baby swings, you will be proud of your purchase. Your kid will love the rocking motions on the swing and time will be saved for you to do your other works. Swings have become a necessity today. You can spend more time playing with your child rather than desperately, constantly trying to soothe them. Here are the best baby swings to ease up on your work and effort.